The historic "Umatilla Rapids" are rapids located along the Columbia River near today's community of Umatilla and the Umatilla River. 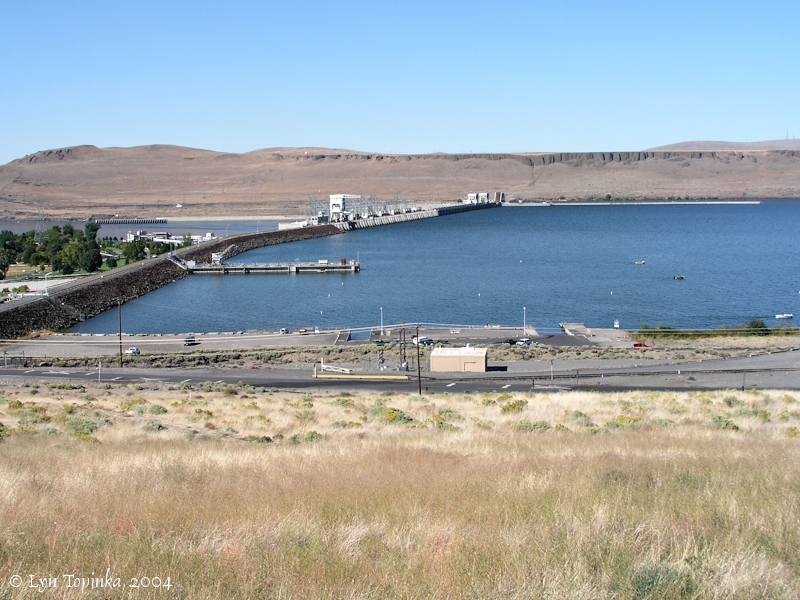 The McNary Dam crosses the Columbia at the location of the Umatilla Rapids. There are rapids located on each side of the Umatilla River. The downstream rapids was called "Devil's Bend Rapids" while the upstream rapids, located at the location of today's McNary Dam, was called the "Umatilla Rapids". Lewis and Clark referred to the upstream rapids as "Muscle Shell Rapid". 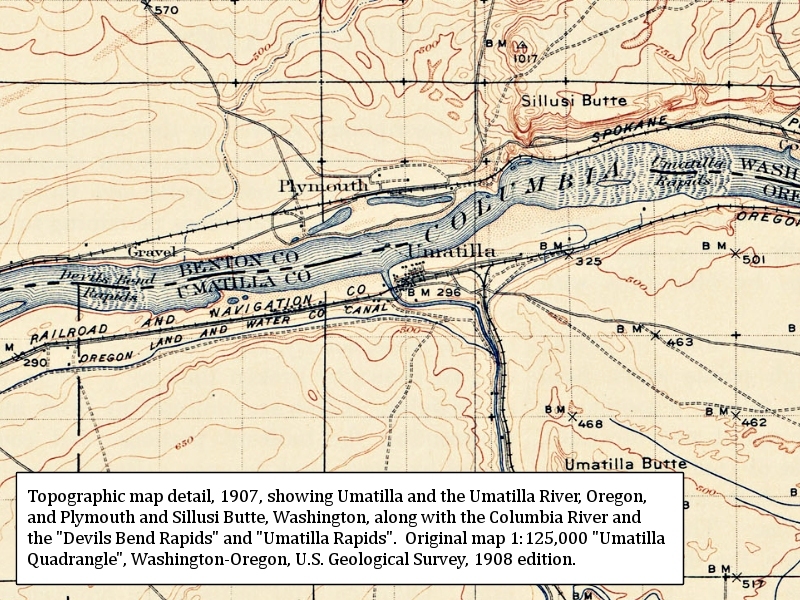 A 1858 military recon map and a 1863 exploration and survey map have "Umatilla Rapids" located the downstream side of the Umatilla River. 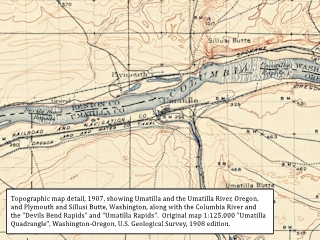 The 1907 USGS 1:125,000 topographic map has "Devil's Bend Rapids" located on the downstream side of the Umatilla River and the "Umatilla Rapids" located on the upstream side of the Umatilla River. Click image to enlarge 1907 Topographic map detail, Plymouth, Washington, and Umatilla, Oregon. 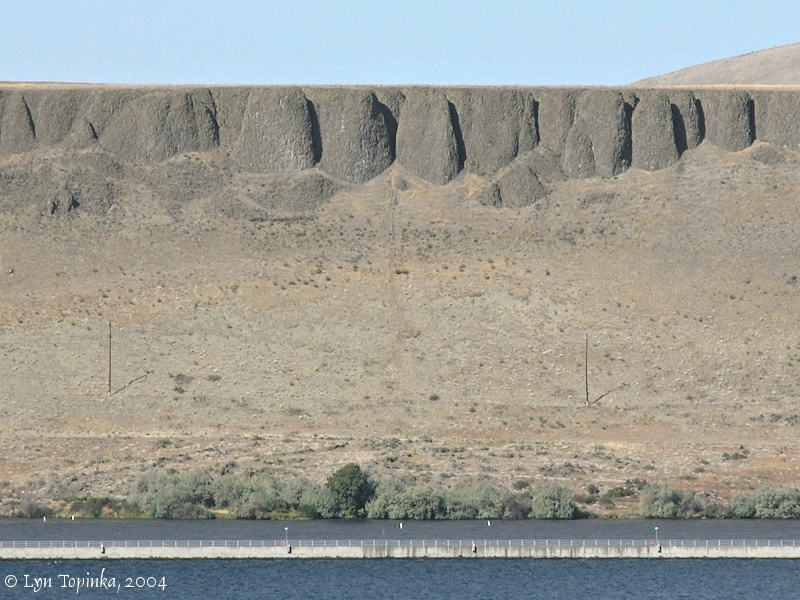 Includes Umatilla and the Umatilla River, Oregon, and Plymouth and Sillusi Butte, Washington, along with the Columbia River and the "Devils Bend Rapids" and "Umatilla Rapids". Original map 1:125,000 "Umatilla Quadrangle", Washington-Oregon, U.S. Geological Survey, 1908 edition. The rapids mentioned by Lewis and Clark in 1805 was located on the upstream side of the Umatilla River. It was labeled "Muscle Shell Rapid" on the route map [Moulton, vol.1, map#75]. On the 11th we commenced ascending the rapid [Umatilla Rapids] -- a task which required all our skill and strength to accomplish; and paddles, poles, hauling lines, and carrying-straps were in requisition in turn, and yet half the day was consumed ere we got to the top. At the foot of this rapid, which is a mile in length, the river makes a quick bend to the east for about two miles, then comes gradually round again to the north from the head of the rapid. The channel of the river is studded on both sides with gloomy black rocks arranged like colonnades, for upwards of twenty miles. Here are some sandy islands also, on one of which we encamped; and a dark and cheerless encampment it was, surrounded and shaded by these gloomy heights." Source: Alexander Ross, 1849, "Adventures of the first settlers on the Oregon or Columbia River", Smith, Elder and Co., Astoria, Oregon. 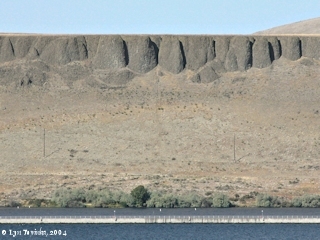 Click image to enlarge Washington banks, upstream of McNary Dam. 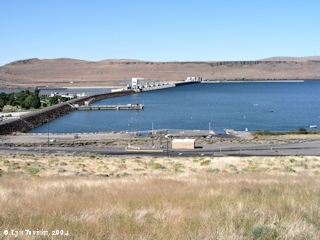 View from Dam overlook, Oregon, Highway 730, approximate location of the downstream end of the Umatilla Rapids, Lewis and Clark's "Muscle Shell Rapid". Image taken September 24, 2004.